I see this eighty year study as one of the most important in psychology. First, lifelong longitudinal research is very rare. Second from the beginning of the study, the quality and comprehensiveness of the data were extraordinary. The study not only used data from the individuals but also data from teachers, families and even death certificates. While cause and effect are difficult to separate, longitudinal research gives a much better opportunity to discern what are the most causal factors. The single most important causal factor the study identified was conscientiousness. This was a combination of persistence and not taking undue risks. Contributing to the phenomenon is that conscientious people tend to have more stable careers, more stable marriages, take better care of their health, and have a sense of purpose and career and life satisfaction. You might say longevity belongs more to the conscientious tortoise than to the carefree, risk-taking hare. Happiness appears to be a byproduct of successful living rather than a cause of longevity. It was interesting that traits such as exceptional optimism and cheerfulness, while especially helpful in some situations, negatively correlated with longevity, apparently due to less concern about and attention to risks. Divorce in childhood and in marriages was strongly negatively correlated with longevity. While being active through life was important, athleticism wasn’t a factor in longevity. It is never wise to base all your conclusions on one study. The longevity study did, however, validate well with other longitudinal studies and with many short-term studies as well. Overall, it gives a hopeful message that you don’t have to be extraordinarily optimistic, cheerful, athletic, and popular to live a long, healthy life. Rather, having goals, persisting with those goals, being conscientious, having a network of friends, and helping others appears to be key factors in health and longevity and happiness. Further information on their research is at www.HowardSFriedman.com. Dr. Brickey is President of the Ageless Lifestyles® Institute. 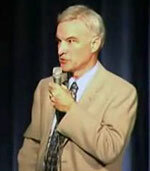 His websites include http://www.DrBrickey.com and www.Anti-Aging-Speaker.com.